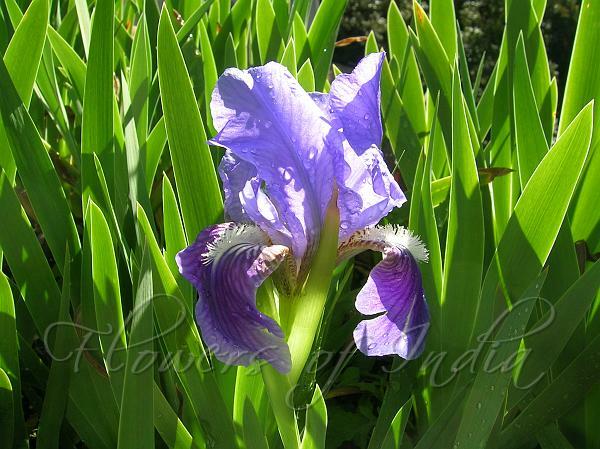 German iris is the mother of most modern bearded iris cultivars. Thousands of bearded iris cultivars have been introduced as garden plants. The plant grows 2-3 ft tall with sword-shaped linear leaves and large usually fragrant blooms on stalks that branch below their mid points. Each flower has six perianth segments: three falls are purple with brown veins, white bases and yellow beards and three standards are lilac. Each stalk, up to 3 ft tall, typically produces up to 6 flowers in spring. Sword shaped leaves are mostly basal, in two ranks, and about 2 ft long. 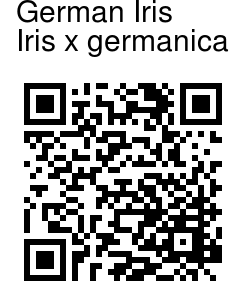 German iris has no bulb. It spreads by creeping rhizomes which form large clumps over time. Thousands of bearded iris cultivars in a rainbow of different colors have been introduced over the years, with cultivars now classified into several different types: miniature dwarf (8 inches or less), standard dwarf (8-15 inches), intermediate (16-27 inches), miniature tall (16-25 inches but with small flowers), border (16-27 inches) and tall (28-38 inches). Origin is uncertain, but species plants are probably native to southern Europe and the Mediterranean area.